Noodles with Fried Scallions | One Picture, A Million Words. I have bookmarked this recipe for cong you mian (noodles with fried scallions) from Saveur.com for a long time and it finally made it to my dinner table tonight. Cong you mian is apparently a widely known Taiwanese dish. I have never tried it so I’m unable to verify the authenticity of this recipe but boy, was it delicious. The noodles had such great flavour due to the scallion oil and the star anise infused chicken broth. I know it is not Taiwanese but I used soba noodles instead of Asian egg noodles because I had them in my pantry, and that did not affect how awesome the dish tasted. 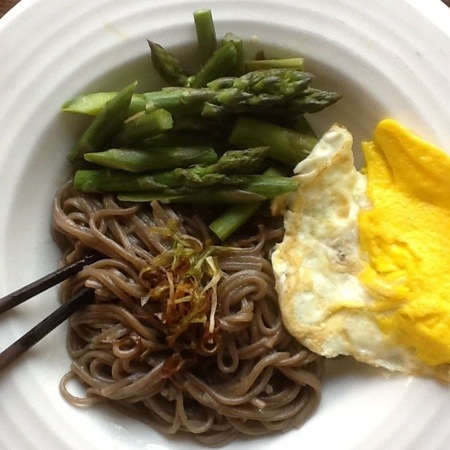 To bulk up the noodles, I sautéed asparagus from the farmers’ market and fried up some eggs. My family devoured the meal. I love it when the week starts on a good note. Naturally, my egg-hater of a daughter had none of the fried eggs. And as you can see, I am crap at frying eggs. Over here at my house, we like to cook our fried eggs to death, so I suppose it doesn’t matter that my fried egg looks a little yin yang with the white on one side and the yolk on the other as long as the whole egg is well done. No jiggly yolks allowed!